Loloma's offers luxury accommodation on one acre of landscaped gardens within 10 minutes of Bathurst town centre. It is ideally suited to meet many different requirements - from romantic weekends away to business and corporate accommodation. Loloma's is set in a prestige estate and has wonderful views over Bathurst and to Mount Panorama. Quiet and peaceful, Loloma's is the perfect choice for those who are seeking to relax and unwind. There is reverse cycle air-conditioning ensuring comfort throughout the seasons, fridge, microwave, smart TV with Netflix subscription, free WIFI, gas fire, iron and ironing board and hair dryer. The Garden Studio is a spacious self contained suite, lavishly appointed to suit the most discerning traveller. 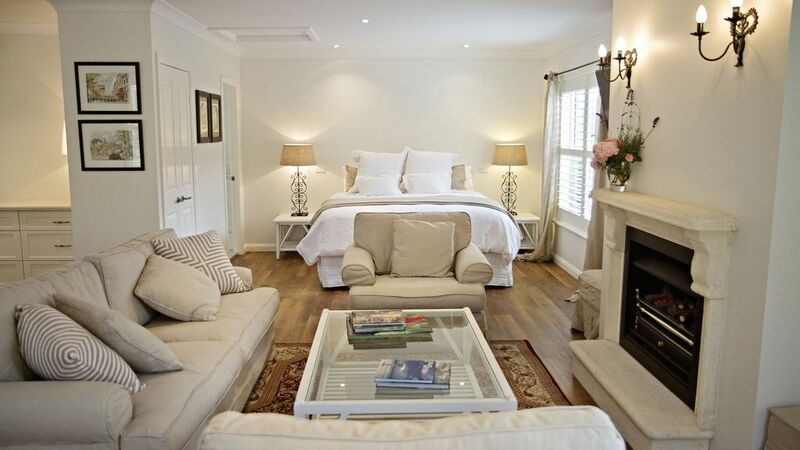 It features a pillow topped king size bed with large linen lounges surrounding the gas fire. There is an open plan dining and kitchenette area and the large bathroom has a bath and separate shower. The studio has an individual private courtyard attached. Additional guests may book the single daybed (additional fee). Please note: there is a 2 night minimum booking on weekends, a 3 night minimum booking on long weekends, a 4 night minimum booking at Easter, Christmas and New Year. Such a calm place to stay. Jennifer was such an accomodating Host. From the minute we walked into the studio we felt relaxed. Very very comfortable. Beautifully designed with luxurious detail. Highly recommend. Will be staying here again. Thank you Jennifer for creating such a beautiful place. I am delighted that you enjoyed your stay and look forward to seeing you again. From the moment we opened the door, until our parting gifts from the hostess, the experience was beyond anything we have experienced before. As brilliant as a stay in the Hilton in the centre of Sydney, more comfortable than anything we have experienced, Loloma's completeness can not be understated. We would love to go back, to see the wrens in the pear trees and to try out the pool in warmer weather! Thank you so much David for staying at Loloma's. I am so glad that you enjoyed the experience and I look forward to seeing you on a future occasion. Loloma's at White Rock is a gorgeous apartment out on the edge of Bathurst. It was spotlessly clean, modern and supplied with a generous hamper. Everything was top quality and easy to use. The decor is calming and the owner very friendly. Highly recommended. Thank you so much Greg. I appreciate your kind comments and look forward to seeing you again on a future visit to Bathurst.